Sliding clasps are very popular closures for bracelets. You can use these techniques for necklace designs, but it's not a common practice. The first section of this page contains important topics to show you the basic concept. 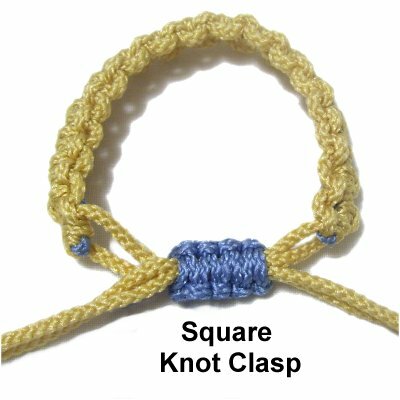 Read the information while you practice making a Square knot clasp. 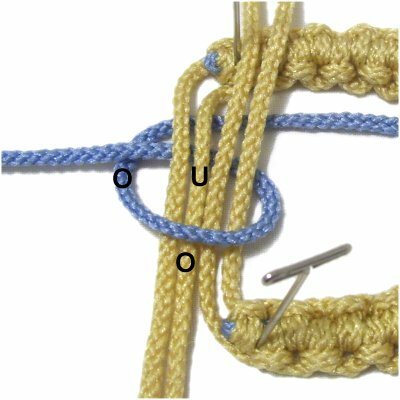 Below those instructions are examples of other knots that can be used to make adjustable clasps for Micro-Macrame bracelets. 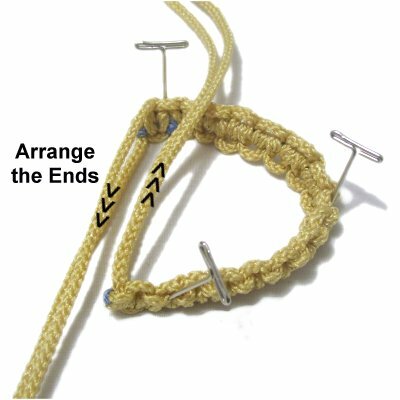 Once you have practiced, try experimenting with your favorite decorative knots to create your own unique jewelry clasps. When practicing Sliding Clasps, I recommend you create a simple bracelet so you can experiment with all the designs on this page. 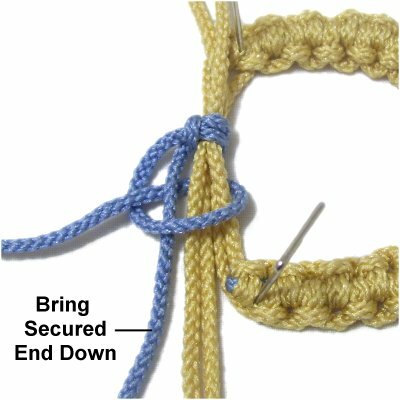 In the instructions below, a sliding clasp is made using Square Knots, to demonstrate some important points. 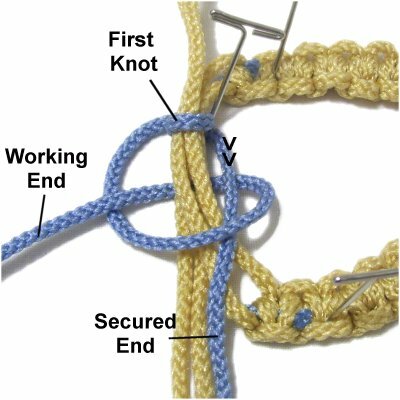 The same steps apply if you are using other knots. The decorative knot used to form the clasp needs to be the type that can be attached to one or more cords. Square knots are the most common. Choose a knot that's FLAT, so it's comfortable. Round or bulky knots should be avoided. 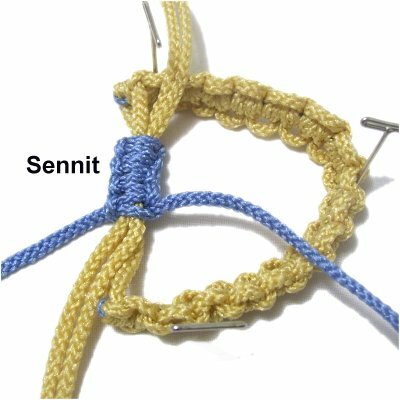 You will usually need to tie a short sennit of the knot you select, so make sure that is possible. A single large knot can sometimes work, too. 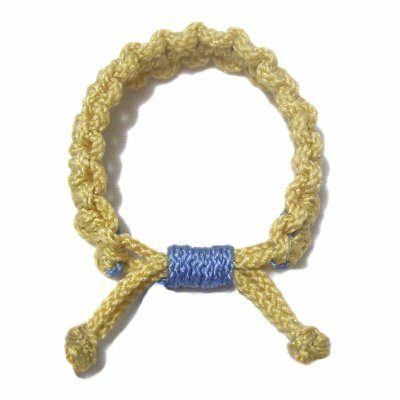 Look through the list of knots in the Learn Macrame section, and experiment with several types until you find one you like for your project. When using this type of clasp in any jewelry project, add 5 - 8 inches of material when you cut the cords for the bracelet. You will need to open the bracelet wide enough to pass your hand through, so the extra material is important. A separate cord is cut for the clasp. Make sure it's long enough to make the type of knot you plan to use. 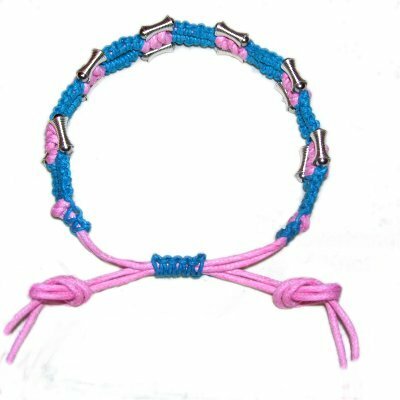 You should start the bracelet design in the center, and work in both directions. 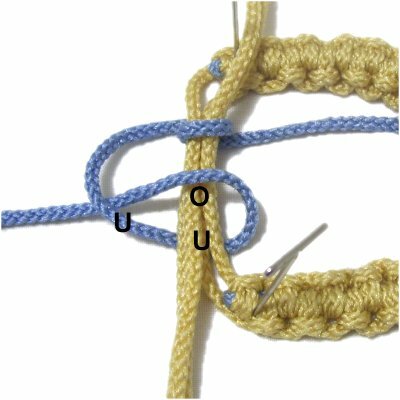 This way the knots are balanced, and you are left with ends that are close to the same length. Sliding Clasps work better if there are no more than 4 cords passing through them. 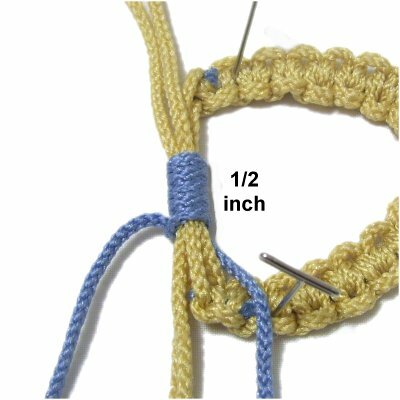 So select two cords from each end of the bracelet, then finish off the remainder. Sliding clasps are usually tied vertically, so place the bracelet on the right as shown in this image. It can either rest on the edge, or be placed flat. The bracelet cords should be arranged vertically as shown. Do not cross them. 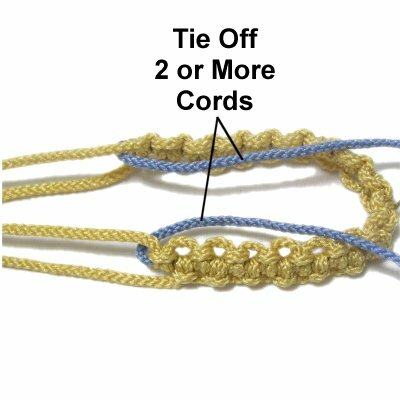 Important Update: The previous instructions suggested you cross the bracelet cords, but it actually works out much better if they rest next to each other, as in the image above. Placing them side-by-side will help them slide through the clasp more easily. Place the clasp cord under the bracelet cords horizontally, or in the most appropriate direction for the knot you plan to tie. 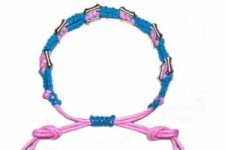 Tie one Square knot with the clasp cord, then check to be sure it's loose enough for the bracelet cords to slide through. Tighten or loosen the knot as needed. Now you tie additional knots to make a sennit. The clasp should be 1/2-inch long, so tie enough knots to reach that length. Important: Open and close the bracelet several times, making sure the clasp does not twist. The knots are too loose if twisting occurs. The bracelet cords should slide through with some resistance. Make adjustments now, before moving on. Identify the back and front of the clasp, in preparation for the next step. Tie the two ends of the clasp cord together with either an Overhand knot or a Barrel Knot. Designer's Tip: You cannot use glue when making sliding clasps. 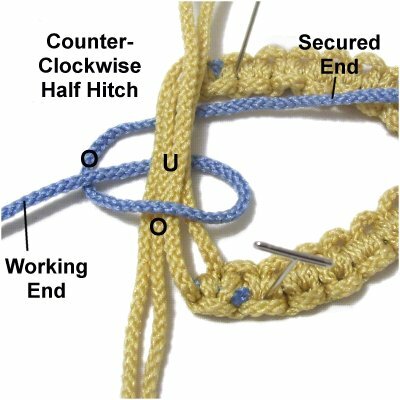 So most finishing knots will have a tendency to loosen over time. When you are working with a material that can be melted, like Nylon, take advantage of that. Since you are practicing, try cutting off the ends of the clasp cord to see if applying a flame to the stub will be enough to stop the knots from loosening. You must now finish off the ends of the bracelet cords, so they can't slide out of the clasp. 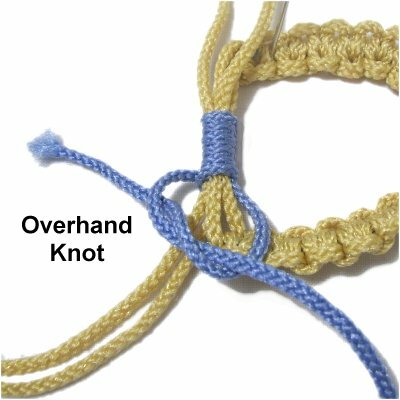 The Overhand knot is the easiest, but other knots will work, too. Beads can also be applied. 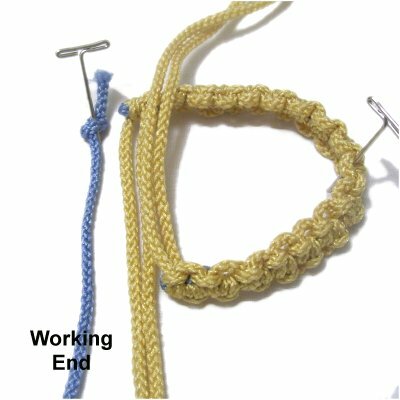 Finish the Ends, continued: Make sure the bracelet is in the closed position. Measure from the clasp down at least 1 - 2 inches. Tie the finishing knots loosely at the point measured. Open the bracelet all the way to the knots, and see if it's wide enough for your hand to pass through. Change the placement of the knots if needed, then tighten them. 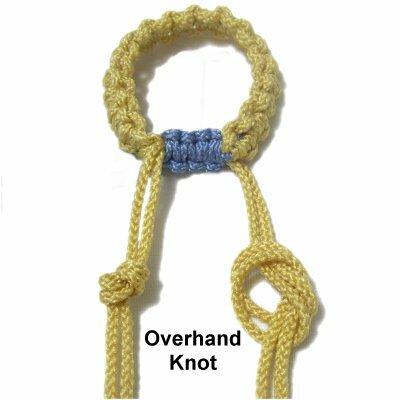 Now that you've learned how to make sliding clasps with the Square knot, it's time to learn how to use other types of knots. 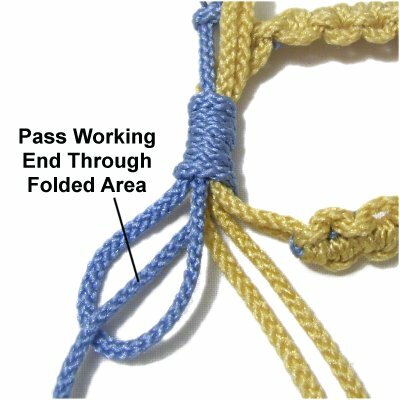 The Wrapped knot, the Half Hitch, and the Vertical Larks Head knot are all described below. 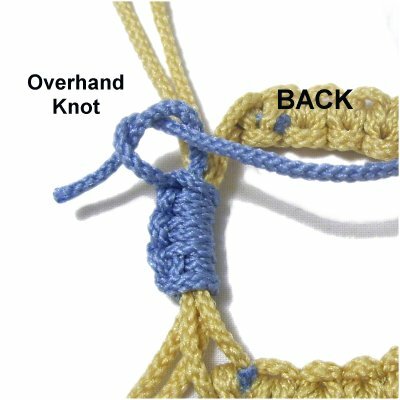 After you have practiced all three, EXPERIMENT with other knots. 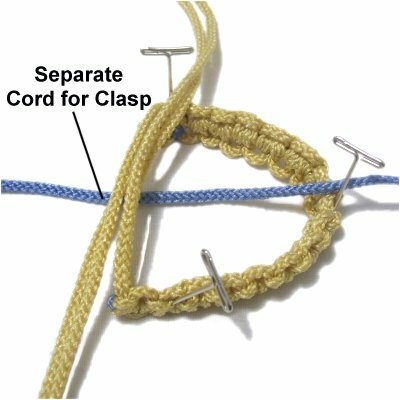 The ends of the clasp cord can be cut off completely after the knot is tightened, so you won't need finishing knots. This technique is a great option for slippery materials like Nylon and Satin. The down side is that this technique does not work with very fine material less than 1mm thick. The Wrapped knot will be too small. It's better to use it with material 1mm to 2mm thick. Arrange the bracelet on the right side of your board. Position the cords vertically in opposite directions. 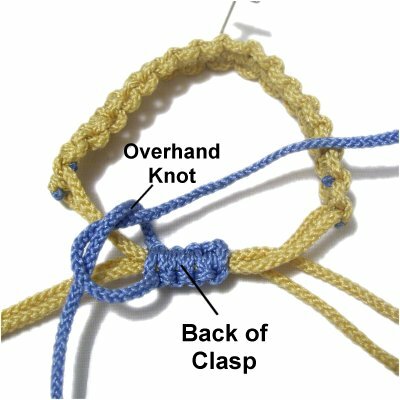 Tie an Overhand knot at one end of the clasp cord. Secure the knot to the left of the bracelet, with the cord arranged vertically as shown. Fold the cord by moving the working end upward, towards the secured portion. Wrap the working end around the bracelet cords, as well as the secured end of the clasp cord. 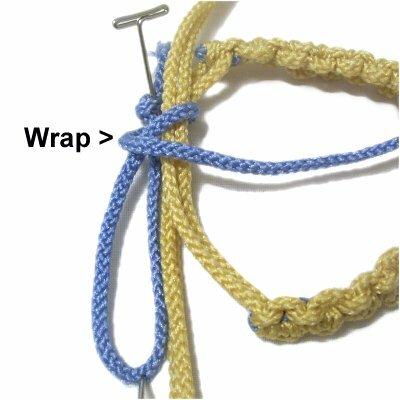 Wrap firmly but not tightly, since the bracelet cords need to slide through the knot. Wrap for at least 1/2-inch. 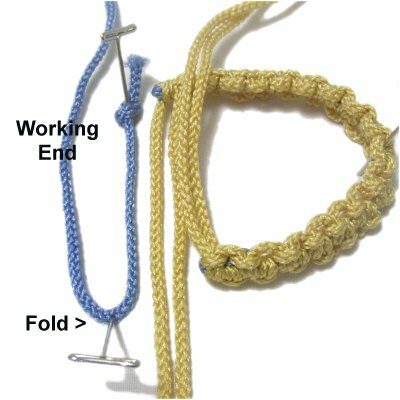 Pass the working end of the clasp cord through the folded area, which looks like a loop. It's better to pass it through from the bottom up. Make sure it's pulled about halfway through the knot. Pull the bracelet cords to be sure they slide through the knot easily. 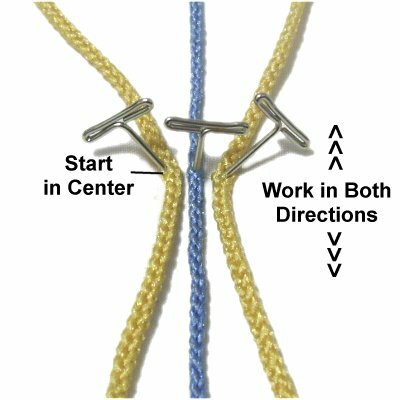 Finish the clasp by cutting off both ends of the clasp cord flush with the edge of the knot. Tuck the stub inside the wrapped portion so it can't be seen. 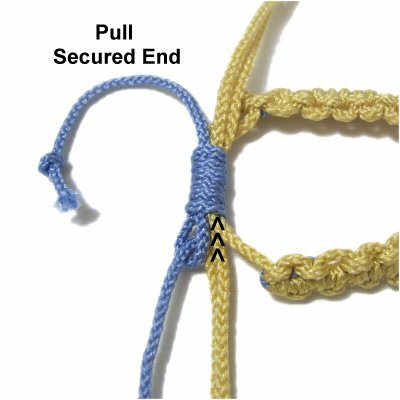 Tie finishing knots with the bracelet cords, at least one to two inches from the clasp. Sliding Clasps can be made with Half Hitches, which will create a ridge on one side and a flat surface on the other. It's important to arrange the bracelet in the proper position so the flat side of the knots will rest against the skin. Arrange the bracelet with the front surface touching the board (upside down). The bracelet cords should be vertical. Secure the clasp cord horizontally under the bracelet cords. Pass over - under the bracelet cords. As you pull the clasp cord to the left, pass over to complete the loop. Secure the loop after tightening (see next image). Move the SECURED end down vertically, resting to the right of the bracelet cords. Tie the next Half Hitch around the bracelet cords and the secured end. Tie several more Half Hitches, until the clasp is close to 1/2-inch long. Be very careful not to over-tighten the knots, so the bracelet cords can still slide. Sliding Clasps should always be tested, so do that now by opening and closing the bracelet. Make adjustments to the knots if needed. Tie off the two ends of the clasp cord with an Overhand or Barrel knot. This is a close up view of the FRONT of the clasp, which will have a ridge. 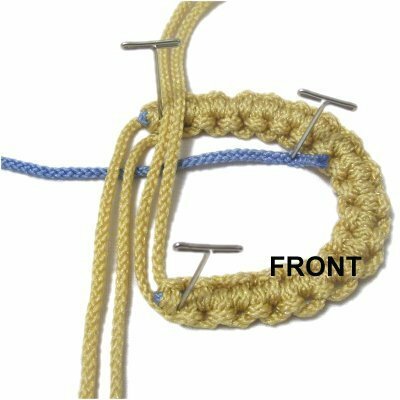 Tie the finishing knots on the bracelet cords 1 - 2 inches from the clasp (in closed position). 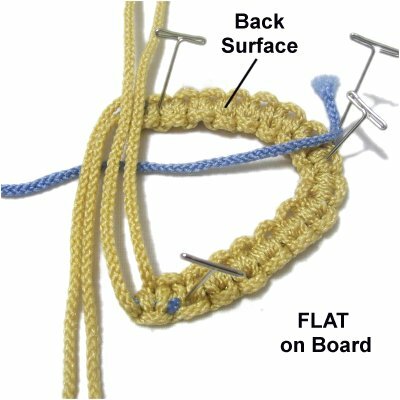 The Vertical Larks Head knot is another option you can use for sliding clasps. 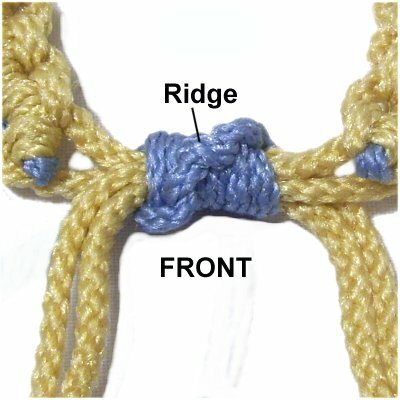 The heads of the knots can face either direction, depending on how you arrange the clasp cord. Arrange the bracelet resting FLAT on the board. The front surface should be face up, and the bracelet cords should be vertical. Secure the clasp cord under the bracelet cords, arranged horizontally. 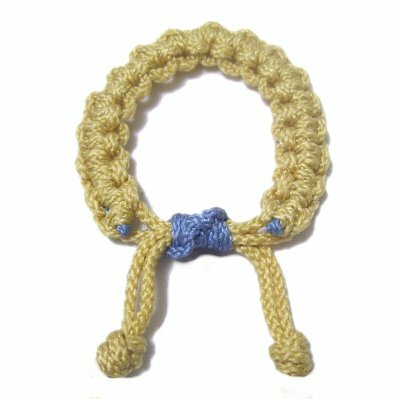 Make the first counter - clockwise loop for the Larks Head knot by passing the clasp cord over - under the bracelet cords. As you pull it left, pass over to complete the loop. Tie the second loop with the clasp cord, under - over the bracelet cords. Pull it left, passing under to complete the loop. Tighten both loops, then check to make sure the bracelet cords can slide back and forth. Bring the SECURED end down vertically, placing it to the left of the bracelet cords. Tie at least 3 more Larks Head knots, making sure the loops pass around the bracelet cords and the secured end. 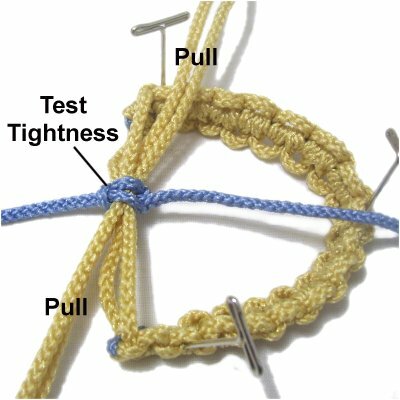 Finish off the clasp cord by tying the two ends together with an Overhand knot (or other technique). Make sure it's in the BACK of the clasp. 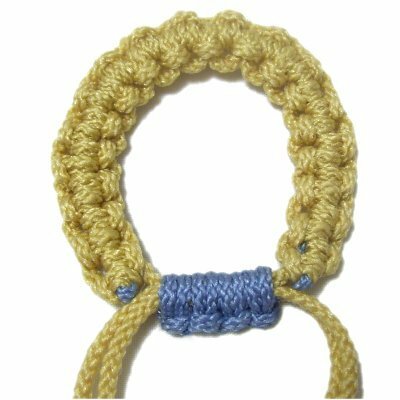 Apply the finishing knots to the bracelet cords. Have any comments about any of these Sliding Clasps? Contact Me.